Publics in the Asian countries surveyed express mixed views about their neighbors, and the divide is deepest between traditional rivals. About seven-in-ten Chinese (69%) express an unfavorable view of Japan, and even more in Japan (84%) dislike China. In India, nearly three-quarters (73%) hold negative views of Pakistan, while 57% of Pakistanis have similar views of India. With the exception of the Chinese, as well as the South Koreans, whose opinion of Japan is mixed (47% favorable vs. 51% unfavorable), Asian publics express positive views of Japan. Fully 77% in Australia and Indonesia have a favorable view, as do six-in-ten Indians. India is also generally liked by its neighbors – majorities in Australia (71%), Indonesia (63%), Japan (60%), and South Korea (52%) hold positive views. Views of Pakistan and South Korea are more mixed. A solid majority in Japan (60%) and pluralities in China (49%) and South Korea (42%) express negative views of Pakistan, while the Australians are split (45% favorable vs. 41% unfavorable). Only in Indonesia does a majority have a positive view of Pakistan; nearly six-in-ten in that country hold a favorable opinion (58%). South Korea receives positive ratings by majorities in Australia (64%), China (56%), and Japan (57%), and by a plurality in Indonesia (43%). In India and Pakistan, however, more express negative opinions than express positive opinions about South Korea (41% vs. 31% in India; 28% vs. 18% in Pakistan). Opinions of Asian countries are mixed in other parts of the world. 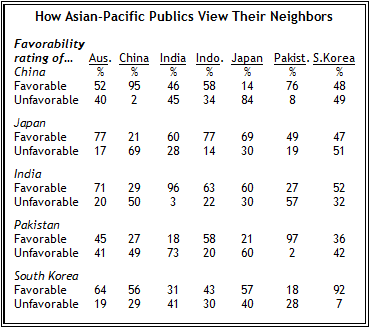 Japan and India are generally viewed favorably, while views of Pakistan and South Korea are more mixed. Publics in 15 of the 17 countries surveyed in North America, Latin America, Europe, Africa, and the Middle East rate Japan favorably. Only in Jordan is Japan viewed negatively by a majority (53%), while South Africans are evenly split (39% favorable and 39% unfavorable). The balance of opinion about India is also favorable in much of the world, but publics in Middle Eastern countries largely dislike the Asian nation. Majorities in Egypt and Jordan (55% in each country) hold negative views, as do half of Lebanese and a 42%-plurality in Turkey. Opinion of India is most positive in Europe. Fully three-quarters in Britain express favorable views and about seven-in-ten in Russia (71%) and France (70%) express favorable views of the former British colony. The British also hold positive views about another country that once belonged to the British Empire – a 56%-majority offers favorable ratings of Pakistan. Egypt is the only other non-Asian country where a majority (51%) shares that view. Opinions of Pakistan are divided in the rest of the Middle East – 49% favorable vs. 45% unfavorable in Jordan, 48% vs. 45% in Lebanon, and 36% vs. 38% in Turkey. 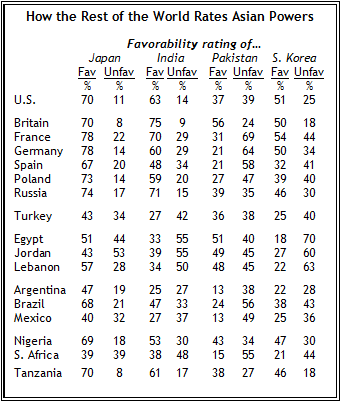 Americans are also split; 37% view Pakistan favorably and 39% view it unfavorably. The French, German, and Spanish respondents are the most negative about Pakistan; 69%, 64%, and 58%, respectively, have an unfavorable view. Overwhelming majorities in China and South Korea believe that Japan has not apologized sufficiently for its military actions during the 1930s and 1940s. This view is expressed virtually unanimously in South Korea (96%) and by about three in four (76%) in China. 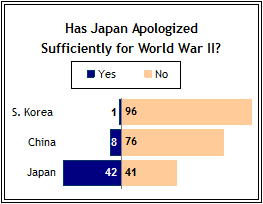 The Japanese are split – 42% think their country’s apology to its neighbors has been sufficient, while 41% disagree. Japanese men and women are about equally likely to say their country has not apologized enough for its role in World War II – 40% of women and 42% of men share that view. The percentage of Japanese women who think their country’s apology is not sufficient has declined somewhat since 2006, when 47% thought that was the case. The percentage of Japanese women who think their country has either apologized sufficiently or that no apology is necessary is virtually unchanged, but fewer now offer an opinion on the matter. While the Japanese are divided about whether their country’s apology for its military past has been adequate, a clear majority opposes changes to Article 9 of the Japanese constitution that would allow the country to establish an official military. Nearly six-in-ten (58%) oppose the changes, including a majority of men (55%) and women (60%), as well as majorities of all age groups. However, opposition to the measure is lower now than it was two years ago, when 67% of Japanese respondents were against changing Article 9.